I hope everyone had a wonderful Valentines Day. I had planned on cooking a family style Valentines Dinner, but I ended up coming down with a horrible cold. The sneezing, coughing and runny nose was so bad that I thought it was best not to cook and touch everything. We ordered Chinese food instead, so everyone was happy. Today I want to share a recipe that has become a huge crowd pleaser in our house. 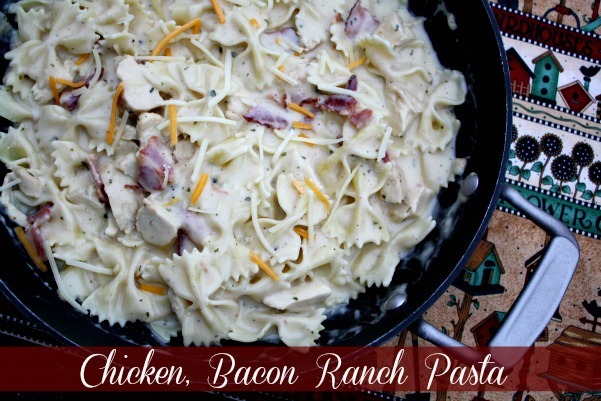 Chicken, bacon, ranch dressing combined with cheese and pasta make up this tasty dish. I've actually made this dish three times, but have been unable to snap a photo. I have been trying to get this recipe posted on my blog and last week I finally got a photo. When I make this dish my husband says the same thing, Tina this is really good. I giggle every time and tell him this is the third we have had this dish LOL. By how my family devours this pasta dish it's definitely a keeper as well as kid-approved. I want to try adding some frozen peas next time and see how that goes over. Let's get started and make some pasta. 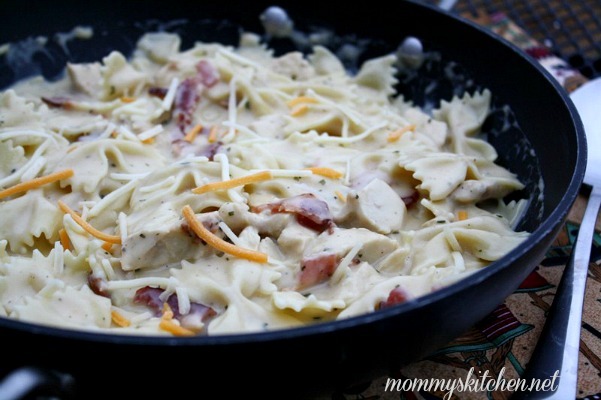 Stir in the cheese blend and bacon pieces. Stir until cheese melts. Add the cooked pasta to mixture and stir to combine. Serve immediately! The original recipe called for cheddar cheese, but I think the three cheese blend makes is so much creamier. It's your preference. I served this delicious pasta dish with a salad and french bread. Bring a large pot of water to a boil. Add dried pasta and cook according to package directions. Drain water. To make the sauce heat butter over medium-high heat, in a large skillet. Add the chicken pieces, and cook until no longer pink. Once chicken is thoroughly cooked, sprinkle the flour and packet of ranch seasoning over the chicken. Stir. Pour milk into the skillet, and continue to stir and cook until mixture starts to thicken (about 5 minutes). Stir in cheddar cheese blend and bacon pieces. Stir until cheese melts. Add the cooked pasta to mixture and stir to combine. Serve immediately! Tina, that looks totally amazing! I'm going to put it on my menu for next week. That looks SO yummy! I was curious, have you tried to reheat this? DH works crazy hours, so he can't always eat things right away. Just curious if it tastes okay when reheated? @ Jen - Im sure it would taste good as a cold salad also. It is kinda like the suddenly salad box meal that you serve cold. My son loves this dish. I make it quite a bit in my house. Yours looks delicious! The sauce thickens up quite a bit after it sits, so I don't recommend it cold. I have reheated it in the microwave the next day for lunch and it is turns out creamy again, so it is great reheated. When I reheated my leftovers the next day, it was even better than it was originally. Didn't think that was possible, cuz leftovers aren't usually better, but it was! Thank you for stopping by and letting us know. : ) I thought it was great reheated as well. Just made this and it was delish! Trying spicy ranch package next time. Tina How long should you let this thicken? Mine turned out a brownish color and tasted sort of strong. Yours looks yummy. You may of had the heat up too high. Once you add the milk it only takes about 5 minutes or so to thicken up, so not long at all. Now that you say that I probably did. I will try it again when it is not such a busy afternoon! Thank you so much! I tried it and my family of 5 love it. Just a thought, I didn't have any powdered ranch on hand. I substituted regular ranch dressing instead and reduced the milk to 1 cup to keep consistency. Turned out great! Hi there! When you substituted the regular ranch for the powdered ranch how much did you use? I cooked this tonight and my husband's words were "this is one of the best things you've ever cooked" def a winner!! I added an onion and cooked it for a few minutes with minced garlic. I cooked them in a little of the bacon grease and butter (bad, i know). I also used spicy ranch mix, which gave it a nice little kick! Thanks for all your great recipes!! I made this last night for dinner and substituted broccoli for the past since we're following a low-carb diet. It was incredibly salty. Am I the only one that has had this happen? Hi Tina! This recipe looks wonderful. I remember having made something like this a while ago but the sauce never quite turned out right. I hope that this time, through this recipe it will. It seems to have a pretty easy flow to it. Thank you for sharing the recipe! I just made this last night with biscuits and my whole house went nuts over it. It was so easy to make and I just used left over chicken I had roasted the day before and it came out wonderful!! I'm new to your site and scouring everything so far I love it!! Thanks for putting this all together and making it easy to understand. Can this be a cold salad??? Can you say FAB-DELICIOUS?!! This recipe was just plain crazy awesome. I could eat this every day and my family thought it was pretty wonderful.....I love cooking a great recipe and this was it! It is wonderful...I added broccoli..